The High Street and the Tweet: is s-commerce retail’s best friend or a sworn enemy? Carnaby Street was once the epicentre of ‘Swinging London’ in the 60’s; and as I take a research-led detour down it this afternoon to reach the tube, I can see why. Although many of the big chains have moved in, it still has that reminiscent charm of a mod and hippie London that really did pave the modern way for Cool Britannia. With the likes of Brit legends including the Rolling Stones, The Kinks and Mary Quant making Carnaby Street their favourite hang-out, I don’t think the place will ever lose all of its original fashionista charm. But enough about coolness and on to a subject that I’m more in-tune with: engagement. Not of the marriage type, but the online-offline kind. My research involves checking out this busy, ‘retail-cool’ epicentre of the world and seeing how stores are engaging shoppers both on and off the High Street. What kinds of activities are they doing to engage punters once they’ve passed the seasonal (so soon to be festive…!) shop window? Is it just about ‘living in the moment’ for shoppers or is there a wider message to be had here that will go beyond just checking out that doggy in the window? Collectively, on average, Oxford Street, Regent Street and Bond Street attract five million visitors per week. 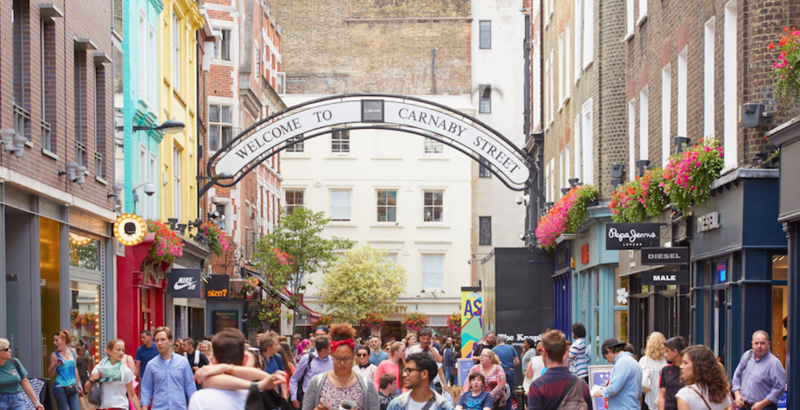 And although exact figures are hard to come by for Carnaby Street as a stand-alone retail district, I think it’s safe to say that the visitor numbers are into their hundreds of thousands each week, being just adjacent to these retail hubs. I suppose my question is: can ‘The Store’ also be a place that can (and should?) drive traffic directly to the web, or indirectly via social media engagement? Are s-commerce and m-commerce friends of or, in fact, threats to the High Street bricks and mortar? This year online will account for around 11% of total retail spending, predicted to rise to 15% by 2017. Online will overtake the High Street for the sale of books; accounting for 52.9% of purchases. Music and video sales, already highly dominated by the internet, are predicted to reach an online percentage of 97.7 of all sales by 2017, therefore virtually obliterating the offline purchase of music. As the photo evidence shows from my stroll down Carnaby Street, it appears that currently encouraging online engagement in an offline retail environment seems to be more of a foe than a friend. Out of twenty-three retailers, only one had a clear website address in the window, and just two had visible hashtag links. One other had a generic ‘Like us on Facebook’ window sticker; hardly encouraging. But perhaps this is for good reason. It might not be surprising to learn that social networking now accounts for nearly a quarter of all time spent online in the UK. And, like it or not, 55% of the UK’s workforce access social media at work, with 6% of them spending at least an hour a day on them. No more breaks chatting by the water machine anymore, it’s chatting with our friends on social media sites across town and across the globe. Time spent on social networking sites is also increasing rapidly. Three years ago, only 9% of all UK internet time was spent on social networks and blogs. However, it now accounts for over 23% of UK internet time – the equivalent of one in every 4.5 minutes. It might therefore not be a surprise, considering so much time is spent on social sites, that social networks increase traffic sent to online retailers by 13% as brands find a way to tap into this powerful group who want to talk and engage. And although Facebook users tend not to use the networking site to find offers and discounts (only 13%) or information about brands (just 6%), 53% of UK fans say they have become more selective about ‘Liking’ brands and companies on Facebook. An interesting twist in the tale comes through when asking what motivates Facebook users to like a company. 49% said it was to receive discounts and money-off promotions (hardly surprising considering the demographics!) but more interestingly, a huge 26% said it was to receive advance notice of new products or future releases, 26% to keep up-to-date with a brand and 22% to simply show their support for the company to others. In other words, a quarter of people like a brand on Facebook just because they are loyal to it and want to ‘keep in touch’. I think it’s, therefore, safe to call these people Brand Advocates; and they are a precious, savvy group that shouldn’t be ignored by the retailers. Their voices are powerful, both for good and bad word of mouth communications. This trend is even more apparent on Twitter with 46% of active users following a brand to receive ‘insider information’, and a massive 42% choosing to follow a company on the site just to keep their finger on the pulse of the organisation. A whopping 32% choose to follow a company on Twitter just to ‘show their support’. Now that’s loyalty for you. It would seem to me that the offline is somewhat afraid to embrace the online in such an open style, given the above stats about shopper trends coupled with my initial findings out ‘in the field’. And can I blame them? Not really. Analysis from PwC and the Local Data Company earlier this year revealed that the chains shut an average of twenty shops a day in 2012, with the figure increasing in the last three months of 2012 as a series of trusted and familiar household names went into administration. The big advantage of online commerce (whether that be ‘e’, ‘s’ or ‘m’)? One word: adaptability. Online allows brands to react and respond quickly to new trends, customers’ needs and engage with them in a way that just isn’t possible on the High Street as it currently stands. What my findings show me is that there is a lack of integrated campaigning; hardly surprising when stats show that 32% of UK small businesses using Facebook say they don’t know how to engage with fans and more than half of companies simply use Facebook as a platform to react to customer issues and enquiries. It is more than possible that offline environments, including retail stores, are actually afraid to engage with their online customer base (both new and existing), in fear that they are driving their pavement-pounding customers away, encouraging them to stay indoors and make purchase decisions in the comfort of their living room. Perhaps the lack of obvious drive to social is a deliberate tactic to disengage customers with online in an attempt to save the very livelihood of the High Street and the people who work on them. Perhaps this is currently the case, but I think there is a better way for the future. Integrated brand strategies that customers can engage with both offline and online can only drive a better, lower-risk and more successful business. One does not need to be afraid of the other; they just need to work together and start talking. I believe they will eventually have to find a way to be friends to ensure each other’s survival; perhaps they just don’t realise it yet. ← The changing face of beauty buyers: are brands ignoring the importance of mobile marketing? → How Will GDPR Affect My (Magento) Business?